London's 24th New Year's Day parade will march the usual route in reverse to appease US television broadcasters, organisers have said. The reverse route will give the American audience the best views of the capital's landmarks, such as Big Ben and Trafalgar Square. 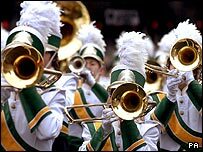 The annual parade is popular in the US and an estimated 100 million viewers are expected to tune in. Last year nearly 4,000 Americans took part, representing 24 different bands. Executive director Bob Bone said: "Each year we act as a fantastic shop window for our city, but we wanted to make doubly sure that London looks at its very best. "We made the change to get even better camera angles for our multinational satellite transmission." More than 10,000 performers representing 20 countries around the world will assemble for the 2010 parade. The parade starts at noon on News Year's Day after a goodwill message from the Queen has been read out to the crowd.